Loreto is a busy place these days. Even though I’ve been visiting for about seven years now, I’m amazed at how things move forward. New restaurants, new shops, new services. “Thriving” might be a good way to describe this little fishing village. The farmers market has been relocated. Apparently the rains have forced it to relocate from the expansive (and dramatic) arroyo to its new location just outside of town. Though the location has changed, all the familiar faces, farmers are on hand each Sunday morning. I’m quite convinced there’s simply no better place to buy Pollo, then at the Loreto Farmers Market. Chicken here is extremely fresh, tender, juicy. I can attest first hand, having enjoyed many a late night grill back in Loreto Bay with family and friends. And, of course, the fruits and veggies are also uniformly outstanding. Tip: come early to get first dibs. On this trip I brought my video gear. If I had my way (and if Loni Stark would entertain my crazy self) I’d be shooting video non-stop. Maybe I need Google Glass? In every direction, there’s stunning vistas. For those accustomed to seeing strip malls, miles (or kilometers!) of cars stopped in rush hour traffic and boxy condos on every street corner, the scenery here in Loreto can be a welcome–if at times quirky–change. There’s many stories to tell. Oh, the people you will meet; the places you will go. This past weekend I shot some clips at the new farmers market, and here’s the result below. One of my favorite aspects of the weekly gathering is the sense of community. It’s quite special to see a mix of locals, visitors, gringos alike enjoying one another’s company. To children I suspect it’s a special tradition. 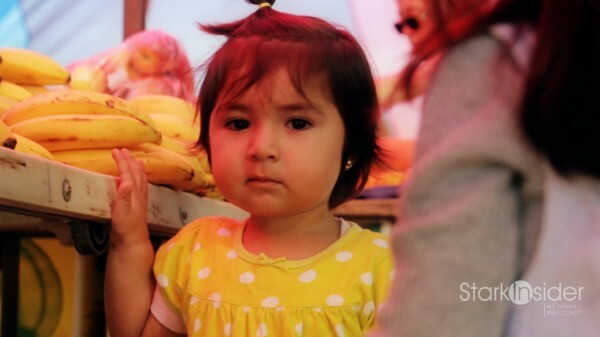 And you can see in this video how the farmers market is every bit their magical fairground.